To make some cheap high voltage capacitors the above is all you need to make them . 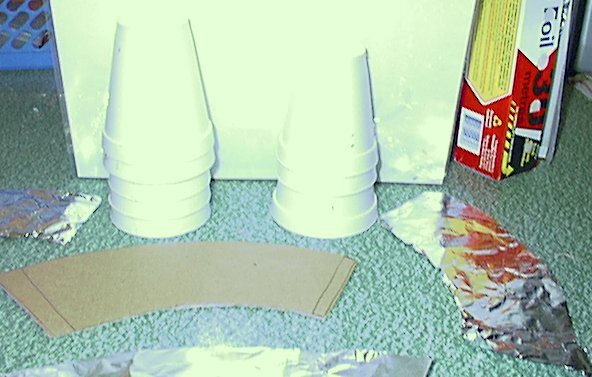 A roll of al foil which can be obtained from a supermarket and some foam cups purchased from the same place,you should be able to get what you need for less than ten dollars. First you will need a template to enable cut your aluminiun to the shape of the foam cup sides. I found that if you cut a foam cup down one side and cut away the bottom you will get your shape. I then lay this foam semi circle on some coardboard and trace it's outline and then extend the length and then use this to cut out the foil shape as shown in picture above. 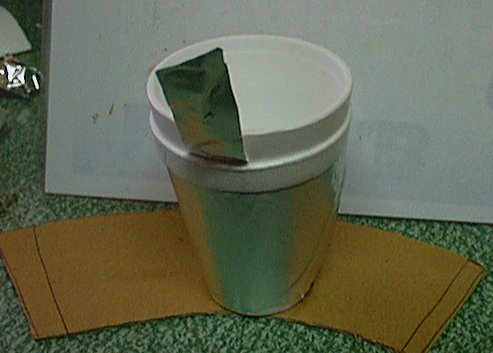 The extra length of the cardboard template semi circle will allow the metal foil that is cut by using the template will allow enough foil completely cover the cup completely along it sides. 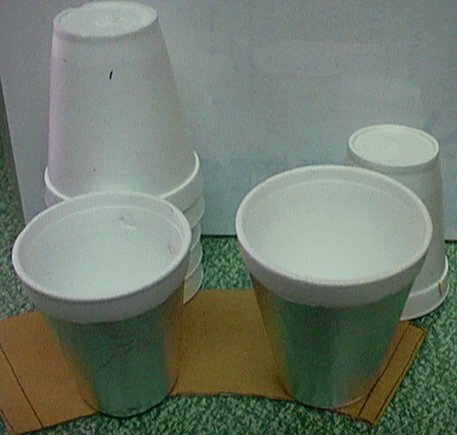 I also have these foam cups placed on a laminate kitchen table that means it's some sort of plastic top and I have found, that if I roll the foam cups over it, there is produced on the cup an electrostatic charge that holds the AL foil on the cups as shown above,and in place when the foil is placed next to it. I have used no glue on thes cups at all. If you don't have a plastic table top to work from, you may be able to produce a small electrostatic holding charge on it, by other means if you so wish,you might be able to get away with not using this method at all. 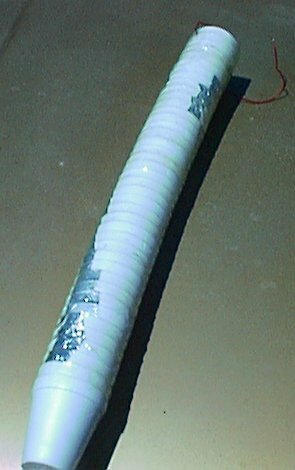 one cup is placed inside the other and these foam the two plates of the capacitor. 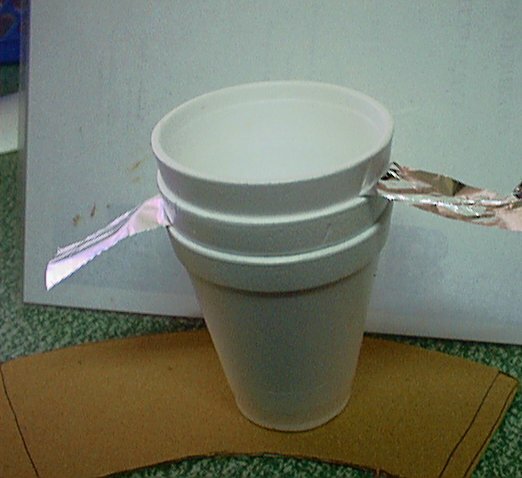 Place a foam cup on bottom without foil and this then becomes a simple capacitor. To get a greater value for capacity just build up your stack as shown as above. The one above has 40 such cups. In the above photograph there are twelve cups in each level and this seem to be a better type of design to work with. One complete layer is configured to be postive plates and the next layer consisting of the negative layer and so on. 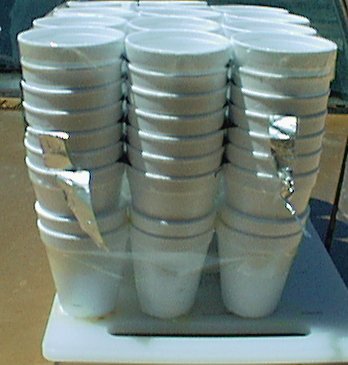 The bottom two layers of cups are there for insulating purposes and are mounted on a PVC cutting board. But if I remove the leads before it has time to fully charge,then it seems to be able to hold this charge with it remaining there for at least one hr,but after a 24hr period the charge sems to have gone,no doubt lost to the air surrounding it. It might hold it's charge better, if you use two cups instead of one between plates and maybe adding a small amount of mineral oil in the lower cup before placing the upper cup in it. Any way I leave this for you to try for yourself. A capacitor works on the principal of have two conductive plates which are very close and are facing each other. When a voltage is applied to one side of the capacitor,the electrons will attract approximately the same voltage on the other plate of the capacitator because of the electrical charge that is built up on the first plate. The new value will always be lower. value = c1+c2+c2 The new value will always be higher. A Note on Polystyrene Capacitors Usually chosen for for applications requiring tight tolerance coupled with high stability. Predictable temperature coefficient used in conjunction with particular ferrite cores makes highly stable tuned circuits or oscillators.